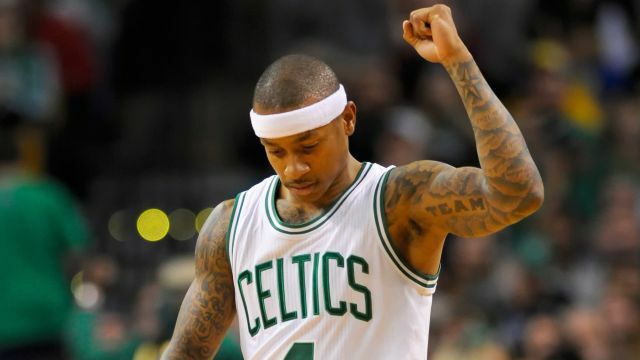 In case you were wondering how the shortest player in the NBA happens to be one of the league’s best scorers, or how a guy who was taken with the last pick in the NBA Draft five years ago is now an All-Star and the centerpiece of a playoff team, look no further than Isaiah Thomas’ work ethic. Thomas is currently eighth in the NBA in scoring at 26.1 points per game and 12th in assists at 6.3 per game. His 10-8 Celtics hold the fifth seed in the Eastern Conference and are second in the Atlantic division behind the 12-6 Toronto Raptors. The C’s had won 7 of their last 10 before Wednesday’s loss, so IT will try to help get them back on track Friday night as they take on the team that drafted him (Sacramento Kings) at the Garden. The Kings haven’t won a game in Boston since January of 2007, so they’ll look to reverse their luck in a game that will feature an entertaining match-up between Al Horford and Demarcus Cousins. Tip-off is at 7:30 pm ET.